Shrimp is America's favorite seafood. Hooray! You've got great taste, America. But before you get busy with this curvaceous crustacean, make sure you're not committing one of these shrimp-cooking faux pas. Yes, this seems to make no sense. Fresh is always better than frozen, isn't it? 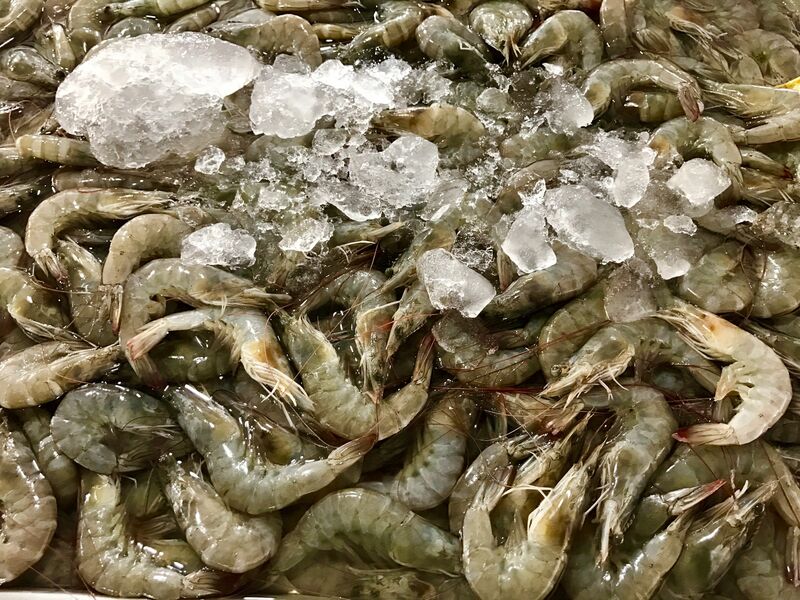 Sure, if you're buying live shrimp from a tank, or from the ocean, then those are indeed fresh and thus better than frozen. Otherwise, what we're talking about are those not-frozen shrimp you see arrayed atop a pile of ice in the seafood case. Those shrimp are not frozen, but they were. Now they're thawed and have been sitting there who-knows how long, slowly succumbing to spoilage, or someone buying them, whichever comes first. Don't be that someone. This goes double for whole shrimp (i.e. with heads still attached). The heads contain an enzyme that can quickly turn the flesh mushy if not separated from the body immediately after harvesting. Buy IQF (individually quick frozen) shrimp in the shell and defrost (and peel) them yourself. You got frozen shrimp, that's good. But the next place folks usually go wrong is thawing. It should go without saying that you should never use a microwave for defrosting shrimp, nor leave them to thaw on the kitchen counter. The best way to defrost frozen shrimp is in a colander in the refrigerator overnight. The next best way is to seal them tightly in a Ziploc bag with all the air pressed out and then run cold water over the bag for 5 to 10 minutes. Don't use warm or hot water, and don't run water over them without the bag, or the shrimp will soak up water and turn soggy. That's also why we use a colander in the preferred method—so the shrimp don't end up waterlogged. Like most seafood, shrimp don't need very much cooking time. Like meat and poultry, their muscles are made up of bundles of fiberlike protein cells. In fish and seafood, however, the bundles are much shorter, and the connective tissue that holds them together is much thinner. Thus, fish and seafood cook much faster than meat and poultry. Not to mention, in the case of shrimp, they're small, so it doesn't take much time for heat to penetrate them. Unlike beef or poultry, which are cooked through at 160 F, shrimp are fully cooked when their little interiors reach 120 F. They'll go from a translucent bluish-green (depending on what type of shrimp you're cooking) to an opaque pink. If they curl up into tight little O's, they're overcooked. Cook shrimp until they're opaque and pink, but before they curl up. We've talked about the heads, now let's talk about the guts. The shrimp's digestive tract, to be exact. Other than the idea of it, there's nothing intrinsically bad about eating shrimp poop. The shrimp itself is basically a large sea insect, and you're already eating it. But the shrimp gut can contain sand and mud, and while you might not taste it, the gritty texture is none too pleasant. So get rid of it! How? Devein your shrimp! The easiest way is with a pair of kitchen shears. Simply snip along the top of the shrimp from the wide end toward the tail and scrape out the little black strip. The beauty of this method is that you can also peel the shells off right then, or leave them on, depending on how you're using them. Devein your shrimp before cooking using a pair of kitchen shears. People in many parts of the world eat shrimp with the shells on, and it's not considered a big deal. They're crunchy! The shells are also super-tasty (see below). But in North America it's customary to remove the shells before eating, so your decision is: Will you remove the shells before cooking? Or after? Or will you serve them with shells on and leave the task of removing to your guests? This is a tricky question, but most people find it messy and a hassle to peel every shrimp before eating it—especially if they're being served as hors d'oeuvres at a cocktail party. Or in a pasta dish, where you have to pick the shrimp up and get sauce all over your fingers. No. Unless you're certain your guests are the sort who expect to crunch away on the shells, make it easy on them and remove them before serving. You knew this was coming, right? Whether to leave the shells on or off is like so many things: it depends. Notwithstanding everything you just read above, one time when it is not only acceptable but also preferable to leave the shells on your shrimp is when you're grilling them. That's because the shells protect them from the intense, dry heat of the grill, so you're less likely to overcook them, and they'll still be juicy when you bite into them. Leaving the shells on your grilled shrimp also helps them keep their shape, instead of curling up as they're prone to do. As for the mess of peeling, if you're grilling, you're probably eating outside anyway, so there's that. Leave the shells on if you're grilling them. So you followed the protocol and peeled the shrimp before cooking them. Good! But don't just throw the shells in the trash. The shells of crustaceans (that means shrimp as well as lobster, crayfish and crab) are loaded with flavor. So much so that an entire cooking technique, for making bisque, was invented for the purpose of extracting it. It involves roasting and them simmering the shells along with some aromatic vegetables. Whether you choose to make bisque (you should) is up to you, but you can also use the shells for making a flavorful shrimp stock or consomme. Store the shrimp shells in a Ziploc bag in the freezer until you're ready to use them. Hang on to those shrimp shells: They're worth their weight in gold. Because it cooks quickly with high heat, grilling is a terrific way to cook shrimp. But shrimp cook quickly—two minutes per side is generally about right. That means you don't want to waste time flipping them one at a time. By the time you get to the last ones, they've cooked for three minutes rather than two. Skewering the shrimp makes it easier to turn them, and it not only makes it harder for one of the little fellows to slip through the grate, but it also helps them keep their shape. But take note: a single skewer is not enough. Try flipping a row of shrimp on a single skewer and they'll likely just spin around on the skewer like reels on a slot machine. A double skewer will prevent that; it also makes flipping shrimp a snap. Grill your shrimp (in their shells) on a double skewer.